Looking for a new managerial challenge where you’ll get enough money to dip your toes in the transfer market right from the beginning? 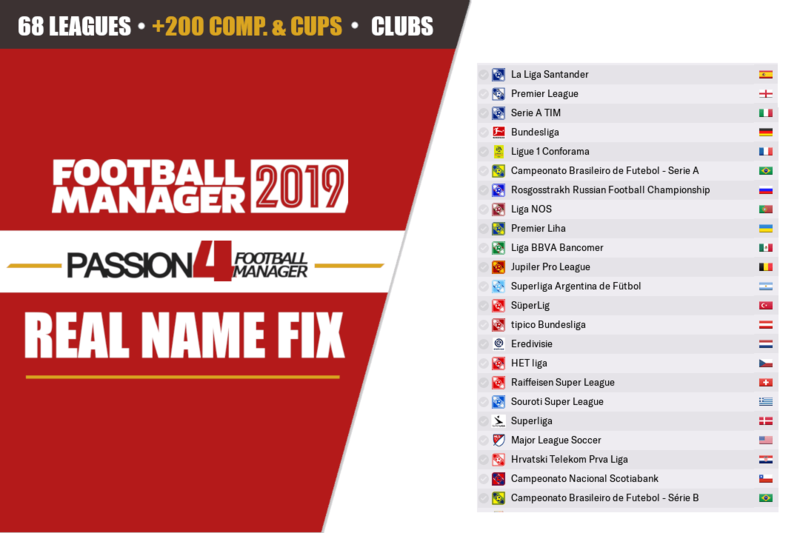 To help you in the search we serve you this massive list of Football Manager 2019 transfer budget and wages featuring the top 150 clubs. Which clubs will have the biggest transfer budget and funds available to buy one to three-star players? Will the English Premier League clubs still lead the way or may Juventus, Paris Saint-Germain and the two Spanish giants, FC Barcelona and Real Madrid come close, despite making some significant transfers in the last transfer window. Here we reveal the clubs with the biggest transfer budget and wages in Football Manager 2019. We’ll decide to limit this article to the top 150 clubs in order to give you some great recommendations of clubs to manage from all parts of the globe. 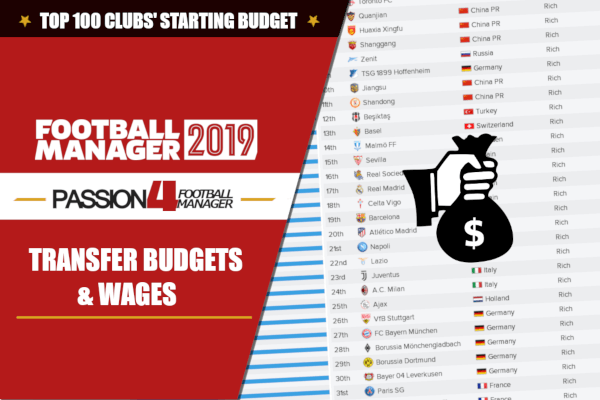 Discover the top 150 Football Manager 2019 clubs with the biggest transfer budgets available. Be able to delve into the ‘crazy’ transfer market immediately and swoop up some of the best wonderkids and international star players more easily. For the 5th year in the row, we hand you our list of the top 150 clubs with the biggest transfer budgets of Football Manager 2019. Here you’ll get some great recommendations of clubs to manage with the highest starting transfer budget and wages ahead of the 2018-2019 season. This means that the transfer and wage budget has been influenced by recent 2018 summer transfers, as money has already been deducted. Our ranking is primarily based upon clubs with the highest remaining transfer budget available when no adjustments have been made between wages and transfers, or the other way around, but we will also display each clubs’ remaining wage budget per week so you’ll know how restricted you’ll be or not. It means that there might be more money available to allocate (primarily by reducing the wage budget), which in turn increases the remaining transfer budget. In some circumstances, adjusting and maximizing the transfer budget might affect the remaining wage budget negatively. The negative wage budget may force you to sell one or more players, or reduce your wage bill by re-negotiating contracts, to be able to keep a positive balance. Learn how to make budget adjustments below. The numbers below will be rounded up to the nearest hundred thousand or the closest whole number. For instance, when transfer budgets are €3.099.586, we have rounded it up to €3.1Mill. We have decided to not include the transfer budgets of unplayable leagues which requires a database extension to unlock, such as clubs in Qatar, Saudi Arabia or Japan. Since there will be clubs from all over the world with different reputation and perhaps knowledge of you, we will feature each clubs media prediction for the start of the first season, either it will be the 2018-2019 season or in the weird circumstances the 2018 season. What’s definitely true, is that the increase in the cost of transfers will for sure be reflected in this year’s edition as well. It might not be as easy to get regular first-team players for under €20 Million for top sides. With the help of our list of the top 150 clubs’ starting transfer budget and wages you will be able to scour through the top leagues of football after clubs with enough money to dip your toes into the transfer market immediately and make an immediate mark on your squad from the first season on, which comes in handy if you’d like to implement a certain tactical style that separates you from your successor, or you simply want to provide depth to your aging squad with a new Football Manager 2019 wonderkid. The starting transfer budget for each of the clubs equals to what is set for the first season (2018-2019) when you control the team. The remaining transfer budget or wage budget can be altered further for those clubs with a positive balance. The transfer budget and the wage budget can be further altered – either decreased or increased by adjusting the budget. Which club will you take control of in Football Manager 2019?